WebSphere MQ File Transfer Edition provides an enterprise-ready managed file transfer capability that is both robust and easy-to-use. WebSphere MQ File Transfer Edition exploits the proven reliability and connectivity of WebSphere MQ to transfer files across a wide range of platforms and networks. 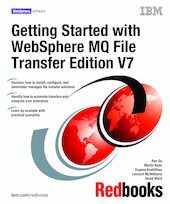 In this IBM® Redbooks® publication, we provide a complete guide for getting started with WebSphere MQ File Transfer Edition. In Part one of the book, we provide a technical overview of the product and provide installation, configuration, and administration guidance for distributed and z/OS® platforms. In Part two, we provide a series of scenarios to show how you can use WebSphere MQ File Transfer Edition to create managed file transfer solutions. These scenarios range from simple point-to-point transfers through to resource monitoring and complex scripted transfers that include the use of Apache Ant. We describe each scenario step-by-step, which allows you to follow along in your own environment. In Part three of this book, we discuss topics, such as security, user exits, and the integration of WebSphere MQ File Transfer Edition with other products and solutions.